This procedure documents the major steps used to replace the bearings in a Boice-Crane oscillating spindle sander. This procedure is based on both my experiences and information gleaned from posts on the Old Woodworking Machines Forum. Please edit it to clarify, correct, and add information. You may encounter differences because of changes made during the production life of the sander or modifications made by previous owners. The brain seems to lose a lot of cells in the time span between when a machine is disassembled and when it’s put back together. Proceed cautiously and document the disassembly as you go. Take a lot of pictures. The last of the manuals listed is particularity useful in that it lists part sizes, as well as, part number and description. It is the version used for the part names and diagram numbers in this write-up. Photo 1 is an exploded view of the major internal parts of the sander and is a good reference when used in conjunction with the manuals/part list. The numbers in the picture correspond to the numbers on the part list diagrams. Blue is Figure 1 and red is Figure 2. Water pump bearings (drive shaft ball bearing) are normally supplied with round shafts and the shafts will need flats ground for the set screws in the pulley and gear. A standard grinder and a little care is all that’s needed to do this. Use the original bearing as a pattern and be sure to keep the shaft cool during the grinding process. A local machine shop can also provide this service. If the original drive pulley is damaged, a replacement can be difficult to obtain because of the extended neck. A double groove pulley could be used, aligning the outer groove with the motor pulley. Another option would be to use a NSK 885586 bearing instead of the NSK 885141. This will provide a longer shaft that will allow a standard pulley to be used. 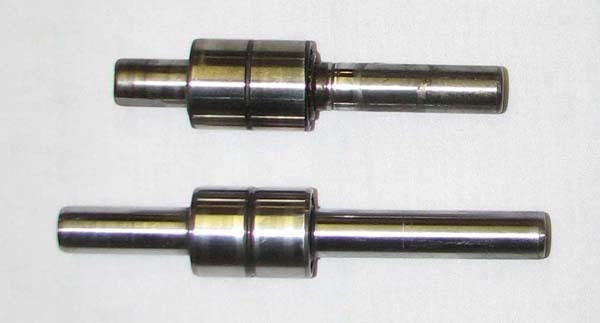 Photo 2 is a side by side comparison of the standard drive shaft ball bearing and the extended shaft bearing. The extended shaft bearing is a drop in replacement. The only difference is the length of the shafts. The bearing with the extended drive shaft was used in this rebuild and did not have to be modified other than grinding the flats. The extra length inside and outside the case did not cause a problem. 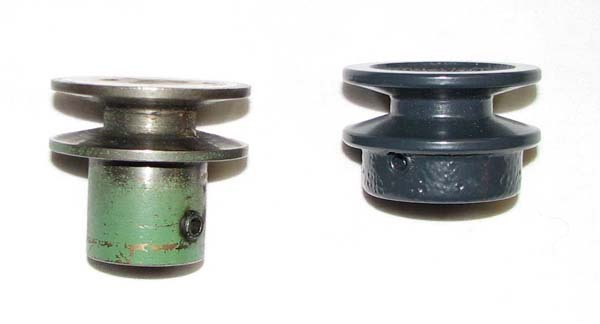 Photo 3 compares the original equipment pulley (left) and the replacement (right) that was used in this rebuild. Note the longer neck on the original. 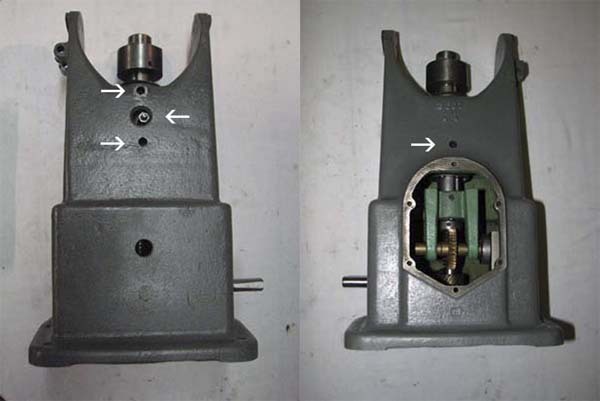 The following procedure for bearing replacement starts with the assumption that the table, trunnions and sanding spindles have been removed and the base casting is unbolted from the stand. 1. Inspect the top of the spindle and housing assembly (photo 4). 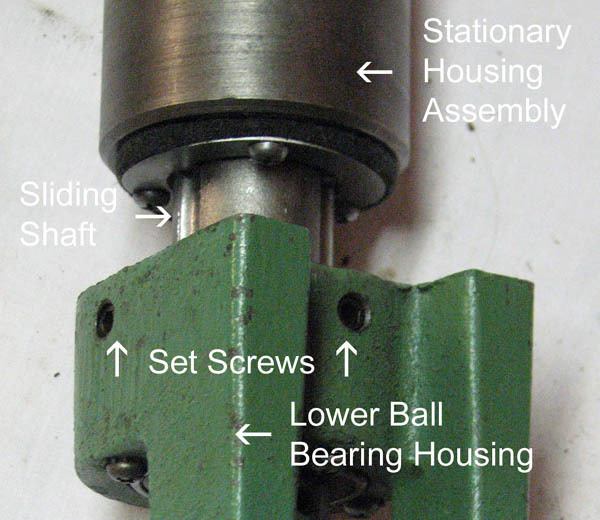 The ejector tool used to remove the taper shaft spindles rests against the upper spindle collar and acts as a lever to force the taper shaft spindles out of the socket. If the upper spindle collar has slipped down allowing the spindle to become mushroomed, it must be carefully filed smooth to allow the upper spindle collar to be removed. It’s easier to do now while the spindle assembly is held in the base casting rather than try to find a way to hold the assembly steady after its been removed. The spindle on this machine was mushroomed and had to be filed. 2. Remove the set setscrew on the upper spindle collar and remove the collar. 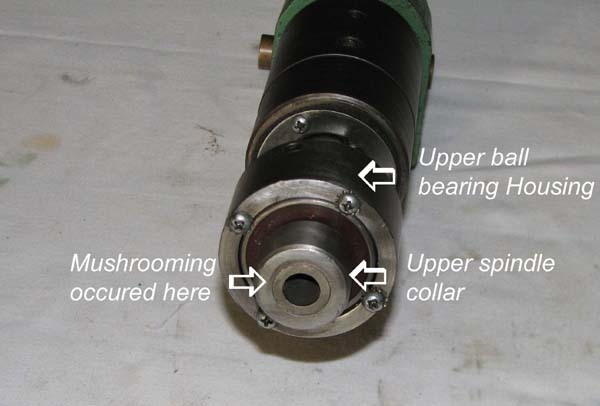 It may be necessary to use a pair of screwdrivers inserted between the upper spindle collar and the upper ball bearing housing to apply force to remove the collar. 3. Drain the base casting by removing the pipe plug from the under side of the casting. After draining, remove the base bottom plate and the base front plate to gain access to the lower part of the spindle and housing assembly. 4. Lay the base casting on its side and unscrew the fixed crankpin from the base casting (Photo 5). Steady the connecting rod with bushings to keep it from binding as the fixed crankpin is removed. 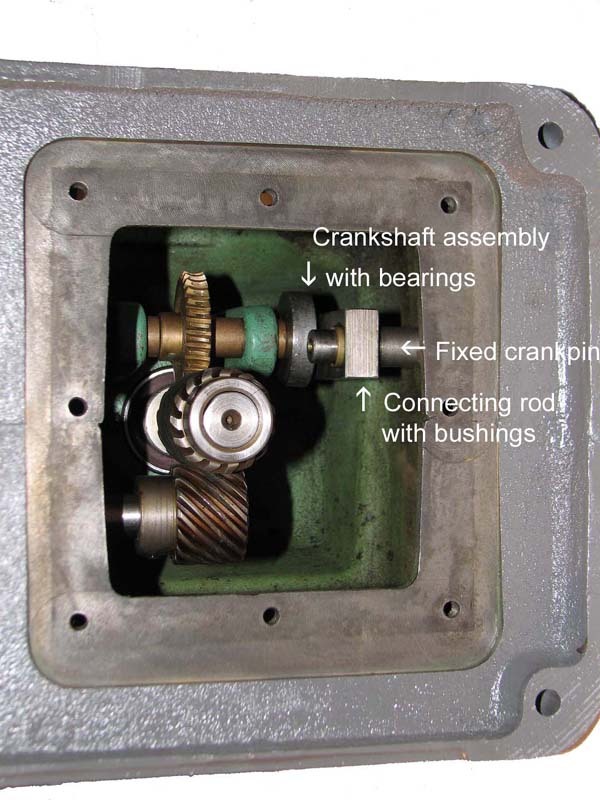 The connecting rod with bushings can then be slipped off of the crankshaft assembly and removed. 5. Remove the grease fitting and three gear adjusting set screws. Photo 6 shows their location. Be careful moving the base casting, the spindle assembly is now loose. 6. 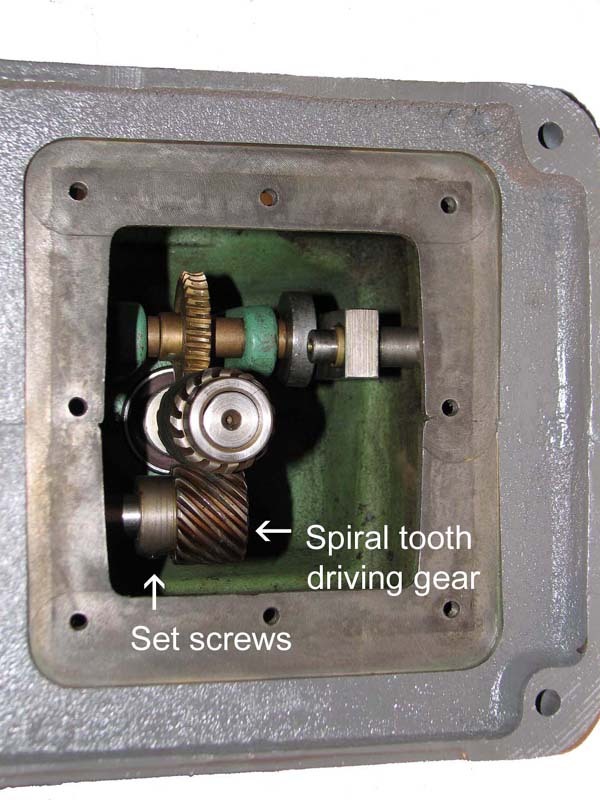 Move the spindle assembly to the side and remove the set screws from the spiral tooth driving gear and slide it off of the drive shaft ball bearing (photo 7). Remove the two screws holding the drive shaft ball bearing in the base casting and remove the drive shaft ball bearing, if possible. For this machine it was not possible to remove the drive shaft ball bearing at this point in the disassembly. It was frozen in the base casting and to prevent damage to other components while removing it, it was left in place and removed later by a local machine shop. 7. 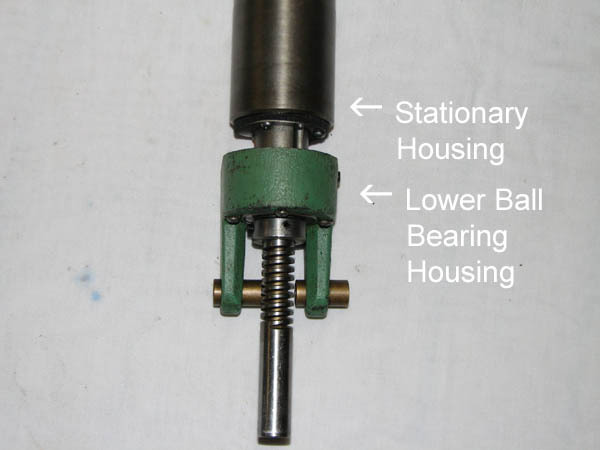 If the drive shaft ball bearing was not removed, it is necessary to reduce the amount of the spindle that protrudes above the stationary housing. This provides enough clearance for the spindle assembly to be moved slightly to the side, so it clears the drive shaft ball bearing. To do this, move the stationary housing away from the lower ball bearing housing (photo 8) as far as it will go. This will move the top of the spindle closer to the top of the stationary housing. The flat on the drive shaft ball bearing must be aligned to provide additional clearance for the lower ball bearing housing. It’s a tight fit! Remove the spindle assembly through the bottom of the base casting. It may be necessary to rotate the lower ball bearing housing as it’s removed so it will clear the sides of the base casting and the drive shaft ball bearing (if it has not been removed). 8. 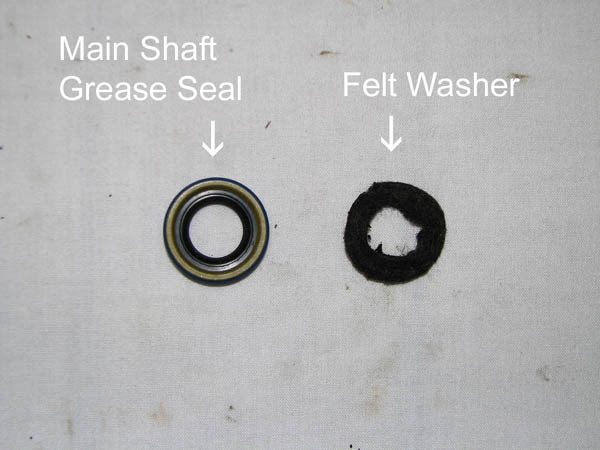 After the drive shaft ball bearing is removed from the main casting, remove the main shaft grease seal and the felt washer from the main casting (photo 9). 9. 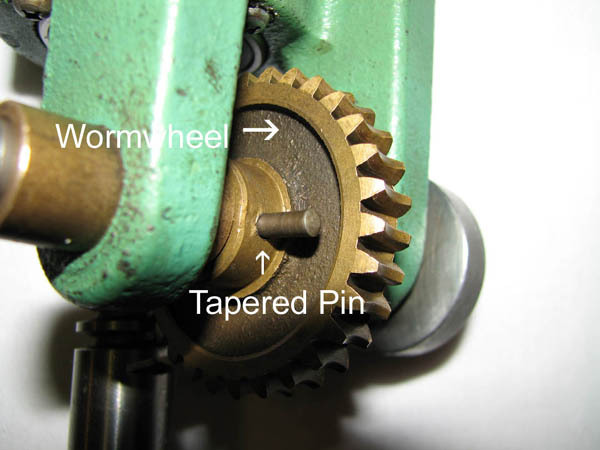 Remove the two set screws from the spiral oscillating shaft gear then remove the gear from the spindle (Photo 10). 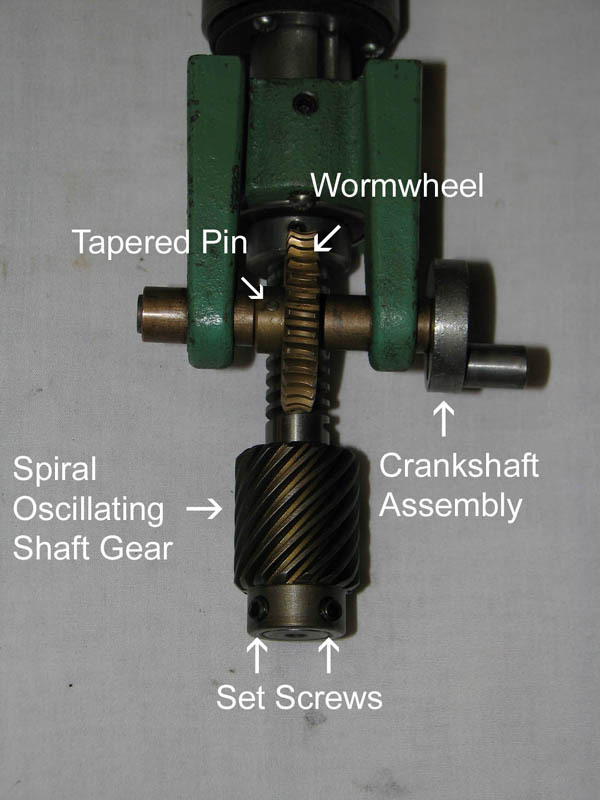 Next drive the tapered pin from the wormwheel and remove the crankshaft assembly, freeing the wormwheel (photos 10 & 11). 10. 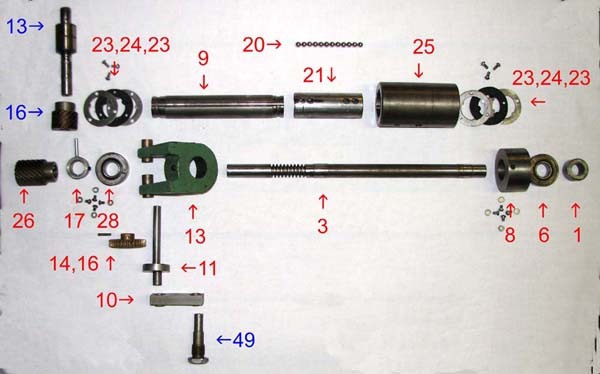 Remove the set screw from the upper ball bearing housing, freeing it from the sliding shaft, and press it and the bearing from the spindle as a unit (photo 12). After the upper ball bearing housing is separated from the spindle, remove the screws holding the bearing in the upper ball bearing housing and press the bearing out. 11. 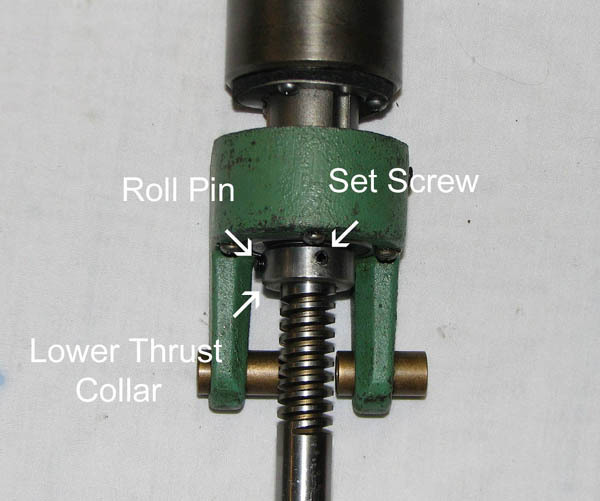 Remove the set screw and roll pin from the lower thrust collar and remove it from the spindle (photo 13). 12. Remove the set screws from the lower ball bearing housing and remove the sliding shaft from the lower ball bearing housing and slide the stationary housing assembly off of the spindle (photo 14). 13. 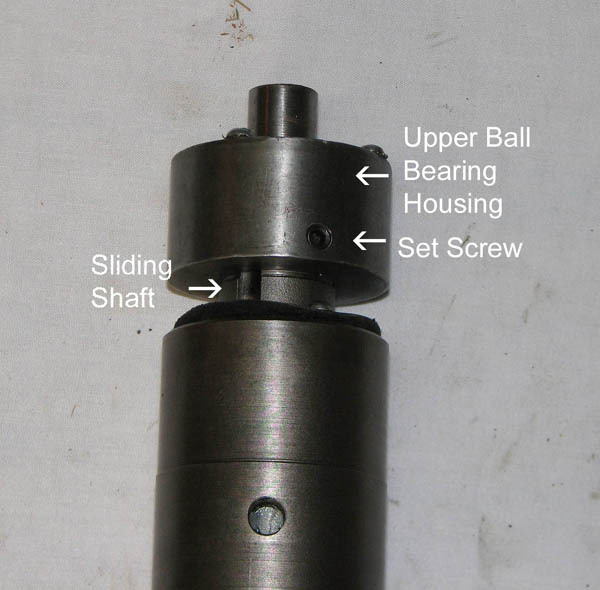 Press the lower ball bearing housing and bearing from the spindle shaft as a unit. After the lower ball bearing housing is separated from the spindle, remove the screws holding the bearing in the lower ball bearing housing and press the bearing out. 14. The spherical steel balls in the stationary housing assembly of this machine did not need replacing. It was disassembled and cleaned because the grease appeared to be contaminated. 15. To disassemble the stationary housing, first remove the steel and felt nibbed washers from the end of the housing. They are secured by 3 screws at each end (photo 15). 16. Slide the sliding shaft out of the stationary housing. 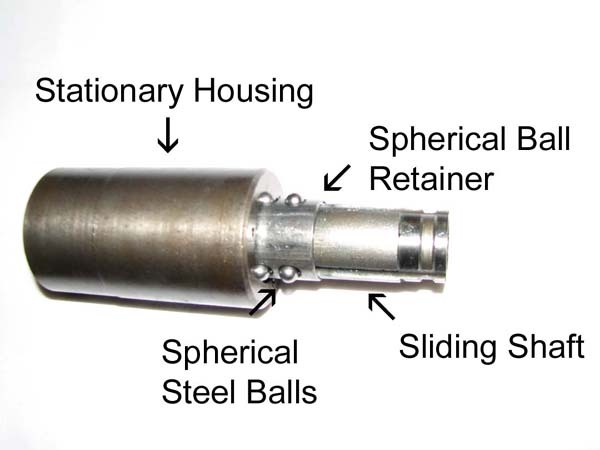 The spherical ball retainer and the spherical steel balls will slide out as the sliding shaft is removed (photo 16). This assembly was taken apart and reassembled in a shallow disposable aluminum pan so the steel balls would not roll off of the table top, under the bench and be lost forever. 16. Reverse the steps to reassemble. 17. Adjust the gears as outlined in the manual/parts list. 18. Fill the base casting with the appropriate oil, grease the shaft and housing assembly.